Hi friends! I hope you're enjoying your Saturday! I'm getting ready to head out for lunch, but I thought I'd just pop in and share a video about my basic, everyday makeup routine. When I am just doing this in real life (and not talking to the camera! ), it takes me under 5 minutes to do this start to finish. 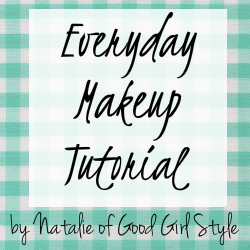 Good Girl Style Everyday Makeup Routine from Natalie of Good Girl Style on Vimeo. 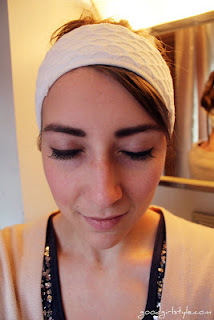 If you're looking to add something dramatic, check out my False Eyelash Tutorial. Love false eyelashes, they don't have to look fake or tacky. Like I said, I am no makeup expert by any means, but I do love to see other people's routines and favorite products, so I thought I'd share mine. Is this similar to your everyday routine? I love watching makeup tutorials! They can be kind of addicting, no? :) I think it's partially because I don't have much skill in this area - it's fun to get tips. Thanks for sharing this. Absolutely! Not much better than a lazy Saturday perusing makeup videos, I've spend many weekend mornings doing just that ;-) Thanks for stopping by to watch mine! Aw, thanks Jessika you are so sweet! Yes, it's all about the eyebrows. I'm glad you love the pink lipstick; it's my absolute fave. I don't even wear makeup and was still fascinated by this little video. Also, good job living in Vermont for so long and still being awesome at makeup;) Also, I nominated you for a liebster award! Hey girl! Just came across your blog, and I LOVE it! Newest follower :) Great tips and tutorials. I'd love for you to stop by my blog and say hi if you get the chance. Have a fabulous rest of your weekend! Hahaha, such a funny comment, Meghan :-) Thanks! !